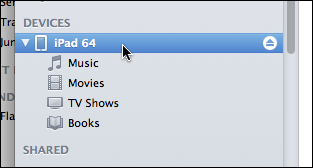 I myself have done a fair amount of grumbling about iTunes over the years. With every year that passes, it seems that we are getting closer to reaching a tipping point of absurdity, frustration, and outright rage. And yet we continue to live with this slow, kludgy monster among us, simply because we don’t have any real choice. It looks like a pretty straightforward situation to me: my iPad is running the latest version of iOS, I’ve turned Wi-Fi syncing on, and so my iPad shows up automatically in iTunes’s source list even when it’s not physically connected by a USB cable to my computer. And the iPad abruptly disappears from the source list now. Why? I have no idea. I didn’t turn my iPad off. It’s just asleep, and it shows up there in the source list, so why can’t iTunes find it? If I wake the iPad from sleep (which makes it reappear in the source list), and then put it back to sleep manually with the button (which does not make it disappear from the source list), and then try again, this time the syncing works. So why didn’t it work the first time? Is iTunes able to “see” the iPad and communicate with it wirelessly when it’s asleep or not? It’s infuriating. If iTunes can’t see/find the iPad, then it shouldn’t be there in the source list at all. If it can see/find it, then it should be there, and I should be able to do whatever I want to do with it. But it looks like iTunes is unable to keep in… sync with what is really happening. Or it does not really know what it can do or cannot do. Whatever happened to Apple and “It just works”? No wonder people are increasingly frustrated with iTunes. The sluggishness and unresponsiveness are one thing. But the totally confusing behaviours and the general unreliability associated with wireless actions just add to the feeling that, when it comes to syncing and other mysterious processes, whether they involve the “cloud” or not, the user simply is not in control and is at the mercy of a finicky, unpredictable piece of software that seems to have developed a mind of its own and cannot decide, from one day to the next, whether it’s going to actually work or not. David Pogue recently wrote an article for Scientific American titled “The Trouble with Wi-Fi.” But in it, he barely scratched the surface of the enormous pile of problems associated with wireless networking. From poor signal reception to mysterious network configurations, the Wi-Fi situation, especially for home and small-business networks, is simply a complete mess. It looks like Apple is slowly, very slowly putting some effort into simplying things, for example with the recent introduction of the new AirPort Utility software that actually makes things like extending a network much more straightforward and accessible (instead of requiring complex manual WDS configuration work). But at the same time we still have a bottomless pit of syncing enigmas and “cloudy” behaviours (they couldn’t have chosen a more appropriate term, could they?) that make people wonder whether they can really trust any of these devices and software applications that have become such an integral part of their daily life. Personally, primarily because of iTunes and the syncing mess, I don’t trust anything. I have multiple backups of everything that is important and even not so important to me. If — or rather when, because it’s bound to happen sooner or later — a syncing operation goes bad and loses my stuff, I should be OK, although it will no doubt be painful to restore things to their former state. But how many users out there take as many precautions as I do? How many people have simply resigned themselves to living in an unreliable world where touch screens don’t respond to taps, voice recognition services fail to recognize their accent, and software apps mangle their data or information in sometimes irreparable ways? I refuse to live in such a world and, because of this, I am endlessly frustrated by all this technology that seems to be based on an engineer’s view of what’s “good enough” as opposed to a user’s view of how things should actually work. What frustrates me the most is that I know that things could be so much better, if only companies like Apple actually devoted sufficient resources to fixing the problems that they themselves have introduced by carelessly piling on “features” to please their marketing and legal departments. While I am not a full-time developer, I have enough technological expertise to know that things could be substantially improved. Apple in particular has more than enough cash in reserve to hire hundreds of specialists to fix these problems. But they too seem to have succumbed lately to the temptation of the “good enough,” and that too me is very depressing. This entry was posted by Pierre Igot on Thursday, May 3rd, 2012 at 8:35 am	and is filed under iTunes, Technology. You can follow any responses to this entry through the RSS 2.0 feed. Responses are currently closed, but you can trackback from your own site.